MOST primary school pupils vowed to follow their dreams no matter what – although for now they may be happier playing video games, a study on children’s dreams found. And if parents spend too much family time on homework instead of activities the kids prefer, the bond will gradually tarnish, a social worker warned. 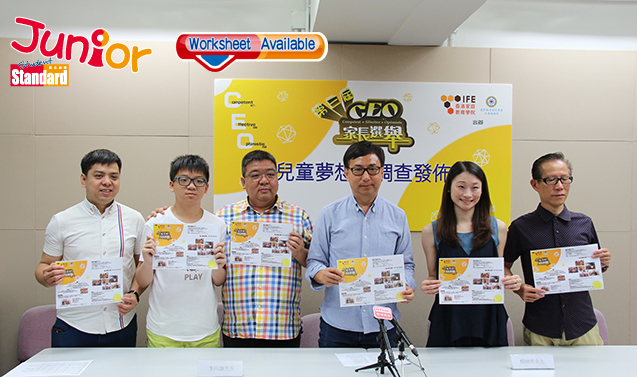 A study this month of over 600 primary students and parents by the Hong Kong Institute of Family Education (香港家庭教育學院) found that 83.6 percent of children have ideas about their future career. Many would like to be a doctor or teacher, and nearly 85 percent vowed to hold on to their dreams even when faced with adversity. Almost all parents (94.5 percent) said they would fully back their children in their bid for success. Parents also remain the biggest influence with 21 percent of children saying they regard their parents as their role models, rather than singers (19 percent) or scientists (15 percent). The finding shows parent-child relationships are still strong, said Tik Chi-yuen (狄志遠), executive director of the institute, but the bond may dwindle when there is a lack of emotional exchange. He said 26.3 percent of parents admitted they spent most of their family time discussing homework, while only 6.8 percent would talk about feelings. “Dreams easily perish as you age and face reality checks. Parents should try to support them,” Tik said, even if these dreams are pie in the sky. The survey also found that playing games is the favourite activity for 33.9 percent of students. Tik said it would be “impossible” to ban games in the household, and parents should let children relax sometimes.